Someone, somewhere seems to have a vendetta with the North East US. We seem to have become quite the dumping ground for the impetuousness of our weather mother. Nary a week passes by without a severe weather warning in the horizon. In the last three weeks, we have had two snow storms, one leaving behind a mountain of white fluff and the other a hill, but still something to talk about! The thing is, I think snow is beautiful, I mean to the point of breathtaking... as it is coming down. Or, if you are one of those catch-the-dawn kind of people, then perhaps, you get to witness it's ethereal beauty before it gets sullied by the reality of life. Then come morning and in the light of day, the romantic thoughts are obliterated by real people and real vehicles trudging through the snow and turning it into grey and then black slush. Not to mention that the slush remains for many days, because the city has political turmoil! Dear elected representatives, please get your priorities right. Clean first, quibble later! Nevertheless, even as the perfect white ground is obliterated with many many black tire tracks and icy slush and mutinous thoughts about city governance prey on your mind, you can atleast take solace in that warm, comforting meal you were planning. 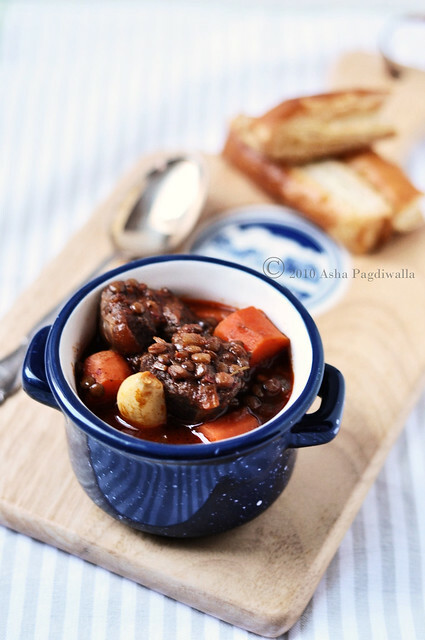 Winter typically brings on cravings for stews and soups. Recently, I decided to go a bit light on the carbs. So, I have been thinking of ways to make a filling meal that does not depend heavily on a carb compenent to furnish that satisfied feeling. In walk, Lentils. Rich in protein, taste fabulous, and intensely satisfying to boot! 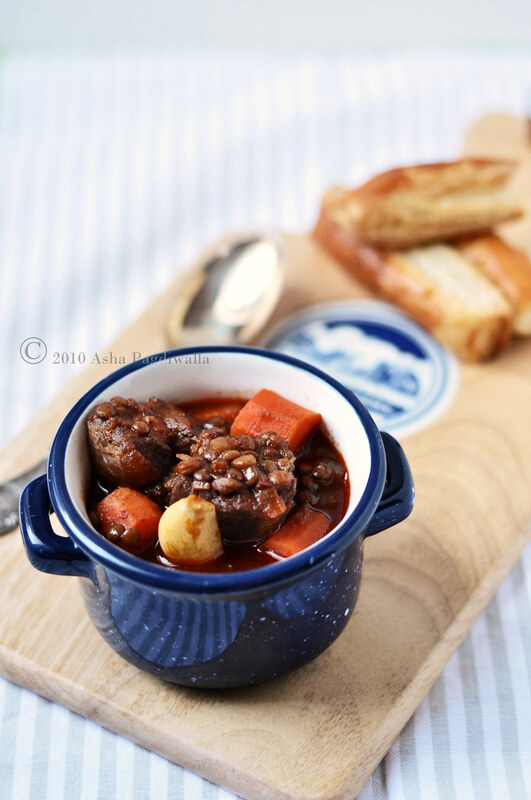 And nothing says comforting better than a good, hearty beef stew. 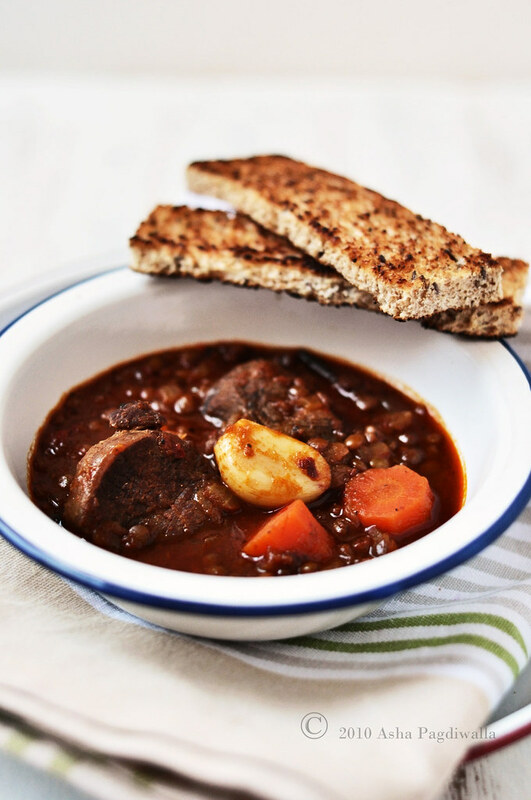 Mine has an extra kick from the harissa marinated beef and the addition of rosemary infuses the stew with becoming earthiness! I have my bowl of stew ready. Now, I just need a blanket and good book and I am all set to brave a storm, whenever it wants to rattle my window! Soak the lentils for an hour in warm water. Mix together the salt, harissa, vinegar and cumin and coat the beef cubes evenly with the mixture. Let the meat marinate in the fridge for atleast an hour. When ready, saute half the diced onion in oil until soft. Add the meat and brown evenly. Add 1/2 cup of stock. At this point, you can transfer to a pressure cooker and cook for about 20 minutes or 7-8 whistles. If you are cooking in a regular pan, cook on medium heat until the meat is done. Add water as liquids are needed. Meanwhile, saute the remaining onions and garlic in another pan in oil. Add the carrots and saute for a minute. Drain the lentils and add to the mixture along with the rosemary and remaining stock. Over low heat, cook the lentils until almost done. 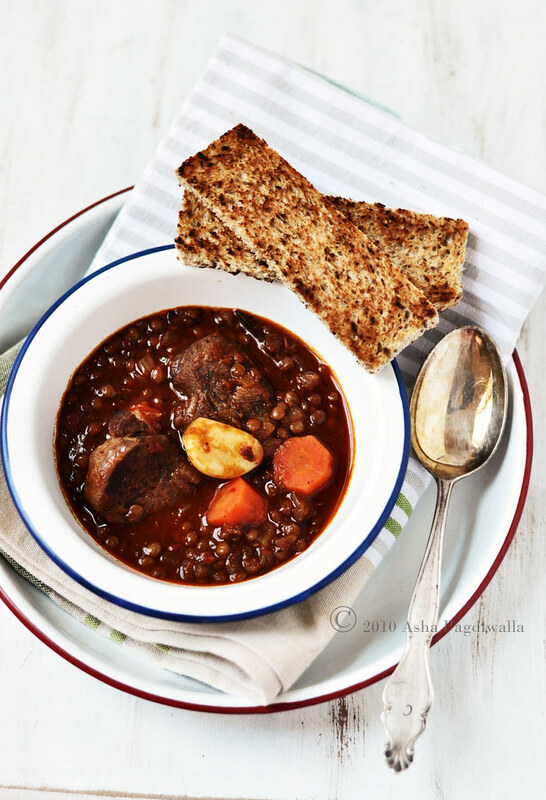 Combine the lentils with the beef mixture and let it simmer for about 15 minutes. Let the stew rest for 15 or so minutes and then it's ready to serve. You can fish out the rosemary at this point, if you want to.